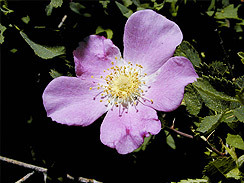 Like domestic roses, the flowers and hips of wild roses are edible. 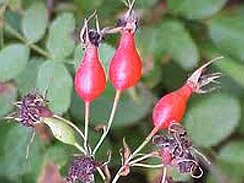 They’re a great source of vitamin C. Most famously, rose hips are used for making tea. 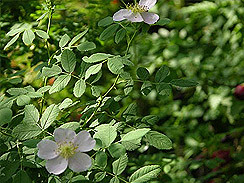 You can also use wild roses for flavoring foods, jellies, add flower petals to salad, or use the entire blossom to decorate desserts. Here in Los Angeles, the wild roses I’ve seen have delicate pink flowers with yellowish tufted centers. They grow to about three feet tall on spindly stems with tiny thistle thorns. They prefer shaded areas and filtered light, so look for them alongside trees. They also prefer areas where limited ground moisture is available. The white end of rose petals, where they attach to the plant, may be bitter. Have a taste, and remove the bitter portion before using in the kitchen. This tea I made at the campfire while tenting. Cut rose hips in half. Rinse berries to remove insects. Cut fennel into small pieces, you can use the stalk and fine lacy leaves. Boil 2-3 cups of water. Add all ingredients and allow to steep for five minutes.